Notes are a receptionist-only feature and are visible to receptionists only. If your receptionists share a single login, notes are visible to all. If you have multiple Switchboard Pro licenses, notes are not shared across all switchboards. 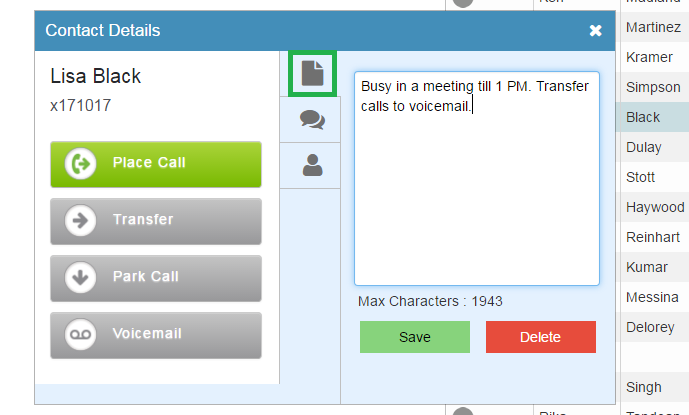 In this example, a contact is busy and informs the receptionist to forward all calls to voicemail temporarily. The receptionist enters a note attached to the contact. Add notes and click Save. 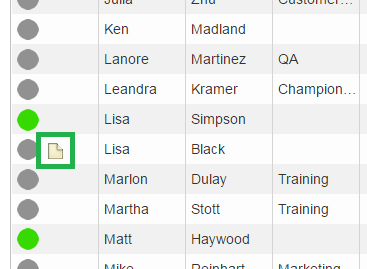 The Contact Directory list indicates notes attached to a contact. You can read a note simply by clicking next to the status of the contact. Copyright © 2015 8x8, Inc. All Rights Reserved.